I bet that got your attention, right? However, I actually did do just that....I hung a picture using a pop tab and it was actually perfect for what I needed it for. Let me step back for just a moment and start from the beginning of this crazy home decor tale. As you know, I have been trying to complete my huge to do list before my little man comes and one thing particularly on that list was to add more wall decor to our home. I am so picky when it comes to accessorizing our home, I sometimes over think the process and don't end up with anything on my walls at all. I don't want to drill any unnecessary holes in our walls for something I don't absolutely love. I happen to have these two beautiful pictures from Homegoods just sitting in our basement that I never hung on the wall. The color scheme matched the Kitchen and Great Room perfectly, however, I just couldn't find the perfect space to hang them. 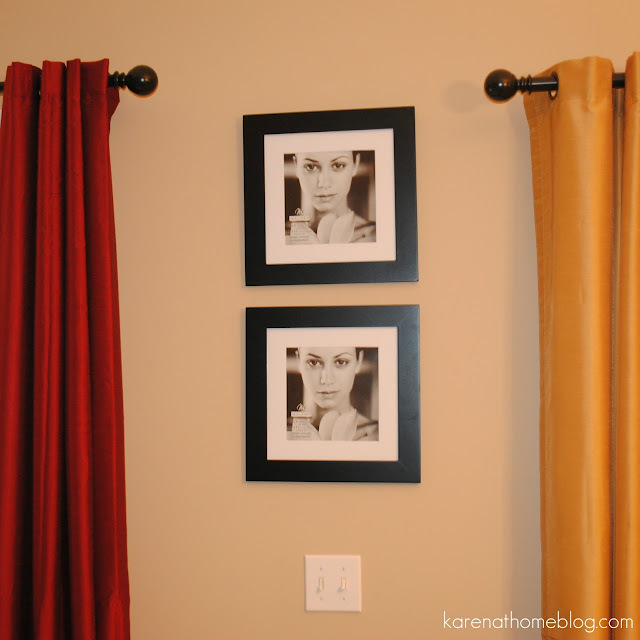 I decided one Sunday after noon to hang them in narrow space between our kitchen and great room curtains. The pictures contained colors that matched both sets of curtains perfectly and would really tie the two rooms together. The only problem was that they seemed a little too big for the space, however, I was determined to make it work. I wish I would have taken photos of this whole process to give you an idea of how this small project of hanging two simple pictures turned into a HUGE project. You may have to use your imagination to fill in the blanks. After careful consideration, I asked Jeff if he could hang the two photos for me. 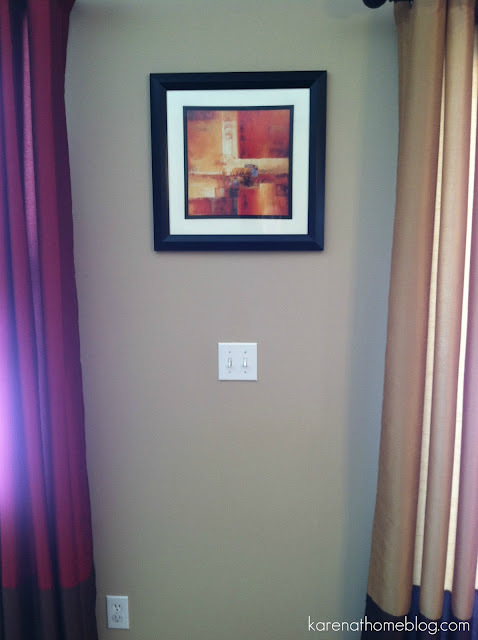 I had measured out the area that I wanted the two pictures hung and thought FOR SURE they would work out perfectly. One on top of the other, between the two sets of drapes. However, once Jeff had drilled the holes into the walls, I wasn't so sure. The top hole was higher than the curtain rods in order to get both pictures to fit. My worst fears were confirmed as he hung up the two pictures. They pretty much looked ridiculous and out of proportion with the drapes. They were just way to high. This is where my stubborn side sometimes interferes with my home decor obsession. I just get a little too determined for something to work and I lose perspective on reality. It may look cute in my head, but not always when it ends up on the wall. Thank God for dry wall spackle because the pictures were only hanging for about and hour before I was already heading to the basement to find out tub of dry wall spackle. Jeff was so not happy with me at this point. We decided that since we really liked the pictures anyway, maybe just one would look good between the two sets of drapes. So Jeff just spackled the top hole and then drilled yet another hole into the wall to center the single picture. If you are scoring at home, that is now three holes drilled into the wall. Fortunately, the single picture now hid two of the open holes and the spackled hole noticeably above the single picture was going to be painted over the next day. At that point, I was happy we had the builder grade flat paint which is easy to paint over my "whoops's" that seem to occur from time to time. My stubborn side got the best of me again and I just did not like the single picture AT ALL. I really wanted the look of a double picture hanging on top of one another. After staring at the single picture all night, I decided I was not happy with just one. It looked way to sparse for the space in my opinion. Now I was really in trouble knowing that we had already drilled three holes in the wall and I wasn't happy with any of it. 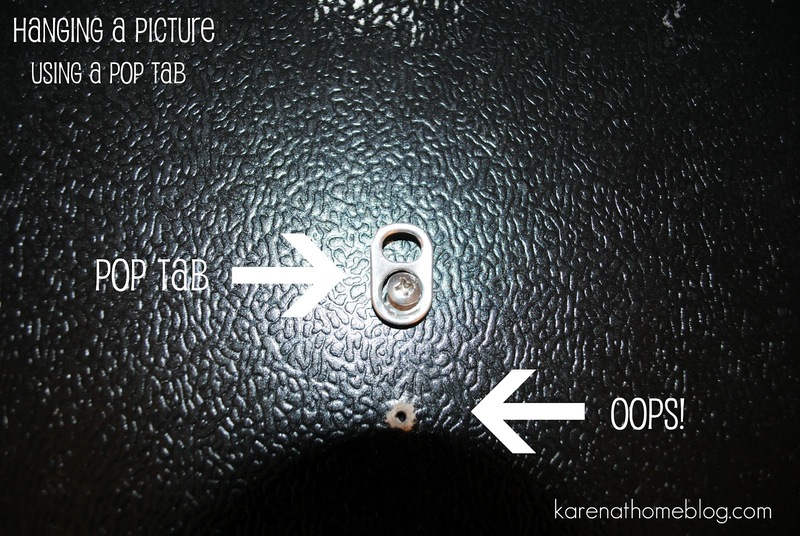 I then vaguely recalled a picture I found on Pinterest about hanging a picture with a pop tab. I also found two square photo frames from Kohl's that were slightly small than the two original pictures. Could I possibly manipulate the two Kohl's frames to work in this space using the pre-existing holes we already had drilled into the walls? I got the two frames out and started hanging them on the wall hoping that the two pre-existing holes would work and wouldn't have to do anything drastic. Unfortunately that was not the case.... The top hole worked out well, the other, not so much. So I did the next logical thing, cracked open a can of pop and went to work trying to pull the pop tab off the top without bending it too much. I held up the second frame to the wall and tried to eye where I thought the frame should go in proportion to the top frame that was already on the wall. For the second frame to work, I needed the pop tab to be screwed somewhere in the middle of the picture frame. I got out Jeff's tool box and found a very short screw and a screw driver. I went to work twisting a screw into the small hole of the pop tab and then forcefully screwed the pop tab then into the cardboard backing using the same screw. I did not use a drill during this process, it was easy enough to screw everything together with just a screw driver. I made sure to twist the screw deep enough into the cardboard so it would securely hold the pop tab to the cardboard backing. If you don't, your picture may eventually fall off the wall! As you can see from my little "oops" in the picture above , it took me two attempts to get the picture to line up just right on the wall below the second picture. Once I had the pop tab positioned to where I wanted the picture to hang, I bent the pop tab slightly back so it would catch on the screw already in the wall. I placed the pop tab on the screw and held my breath, waiting for the picture to come crashing down to the floor. To my surprise, it worked!!! And it's still hanging there today. Jeff came home from work and saw what I had done. He agreed that out of everything we tried for this space, this looked the best. Then he about passed out when I told him the second picture was hanging from our wall with the help of a pop tab. Ha! Whatever it takes to drill less holes in our walls. Now I only need to find two colorful pieces of scrapbook paper in the colors on the room. I am getting a little tired of this woman staring at us as we watch TV. Genius!!! Thanks for the lesson. That's hysterical! I never would've thought of that. I sure wish I would've known about this awhile back! HA! I have used pop tabs for hanging frames too! It is a brilliant idea. I purchased a poster size frame from IKEA without realizing there was no hanging "tab" on the frame... enter the pop tab and voila!